The fourth Pokemon film, Pokemon 4Ever: Celebi – Voice of the Forest, 「セレビィ時を超えた遭遇」(lit. “Celebi: Encounter Beyond Time”, officially “Celebi: A Timeless Encounter”) premiered in Japanese theaters on July 7, 2001 and a year later on October 11, 2002 in America. We talked about how Entei – Lord of the Unknown Tower (hereby Entei), though itself a mediocre film, should be praised for attempting to find the key attributes that make a Pokemon film good. Were they able to figure out those important points in time for Celebi – A Timeless Encounter (hereby referred to as Celebi)? Or did they crash and burn failing to correct course for the Pokemon movie franchise? Let’s take a look! In the beginning, Celebi introduces a young boy named Yukinari (Sam in the English dub) setting off to enter a deep forest whilst on a journey. A resident of a nearby town named Towa warns him of a legend involving the Guardian Deity of the Forest, a Pokemon who protects the forest and has the power to travel through time. After thanking the villager for the warning and entering the forest, Yukinari encounters a Pokemon Hunter chasing down a Celebi, the legendary Pokemon that Towa mentioned. Realizing he cannot let the poacher capture the forest guardian, Yukinari intervenes to protect Celebi. However, in an effort to escape, Celebi makes magical cry, transporting itself and Yukinari 40 years into the future. Knocked unconscious as a result of the time leap, Yukinari is found and rescued by Satoshi (Ash Ketchum) and his friends. They take Yukinari to the nearby town where Towa, now the village elder, is shocked and relieved to find Yukinari in good health after being missing for 40 years. Upon regaining consciousness, Yukinari remembers the Celebi that he saved from the Pokemon Hunter and rushes off back into the forest to find it, with Satoshi and friends in tow. They manage to locate the injured Celebi and proceed towards the forest’s Lake of Life whose water is said to have miraculous healing powers. While on the journey, Yukinari, Satoshi and company encounter the Team Rocket officer named Vicious (called The Iron-Masked Marauder in the English dub) who learned of Celebi from the Pokemon Hunter who chased it 40 years ago. He has his eyes set to capture Celebi and use its powers to take over Team Rocket. Yukinari and Satoshi are able to fend off Vicious’ attack, and he loses their trail. The team find the Lake of Life and use its waters to nurse Celebi back to health. Unfortunately, celebrations are short-lived as Vicious tracks the group down and manages to capture Celebi and corrupt its mind using the power of his special Dark Ball, a type of Pokeball that is able to subdue any Pokemon and, by turning them evil, brings out their latent powers. Vicious, with the brainwashed Celebi, commands Celebi to destroy the forest to test its power. Yukinari and Satoshi, with the help of the legendary Pokemon Suicune, manage to break Vicious’ mind control over Celebi. However, Celebi, exhausted of all its energy, is slowly dying. The battle’s rampage destroys much of the forest which acts as Celebi’s life source. Though Satoshi and Yukinari bring Celebi back to the Lake of Life, even the powers of its water could not heal Celebi, and it passes away. As our heroes weep, numerous Celebi from various different time periods suddenly convene together at the lake after sensing the trouble going on in the forest. Using their energy, they turn back the clock and bring the deceased Celebi back to life. With Celebi revived and Vicious defeated, peace returns to the forest once more. Celebi and Yukinari leave Satoshi and his friends to return back to their proper time period, 40 years in the past. Before he departs, Yukinari and Satoshi promise each other that they will meet again someday. In previous reviews, I mentioned how important it is for a Pokemon film to be able to stand on its own without need for intimate knowledge of the franchise. Celebi passes this test with flying colors. Most of the characters, including primary villain, Vicious, the villagers, and Yukinari all debuted in this movie. Celebi fleshes out distinct personalities and motivations elegantly throughout the film. Just as importantly, the legendary Pokemon at the center of the film, Suicune and Celebi, have their entire lore explained within the duration of the film. The film has no prerequisite knowledge to understand these Pokemon’s powers and abilities. Speaking of powers and abilities, recall that my biggest gripes with both Revelation-Lugia (hereby Lugia) and Entei – Lord of the Unknown Tower revolved around how the titular legendary Pokemon were represented in their own films. Lugia was pitifully helpless in his own film and Entei’s uninteresting, unstoppable power ruined all sense of tension and drama. Celebi strikes the perfect balance of showing its legendary Pokemon: They’re powerful without being indomitable gods, vulnerable without seeming utterly helpless. Celebi also returned to the idea of humanizing the titular Pokemon, a notion unused since the first film, Mewtwo Strikes Back (hereby Mewtwo). Mewtwo may have been the evil antagonist of the first film, but Mewtwo was sympathetic and compelling. Mewtwo was humanized through his distinct, human-like voice and the motivations behind his actions. He even developed and changed, showing compassion towards the end of the film. This important ingredient of giving its central Pokemon depth and humanity was lost in Lugia and Entei, where the titular Pokemon had hollow one-dimensional personalities that made them seem more akin to robots than to living, feeling creatures. Lugia, powerless as he turned out to be, was a cardboard cutout of an omniscient deity, while Entei had basically no agency or personality at all, speaking and acting only to serve Mii in the previous film. Unlike its predecessors, Celebi doesn’t speak a word of human language in the film, but manages to convey a distinct personality through mannerisms. A large part of Celebi involves Yukinari, Satoshi, and Celebi bonding and becoming friends with one another, and this invests the viewer into Celebi as a character. In the short duration of the film, we see what makes Celebi angry, scared, happy. We share Celebi’s excitement as it played with its newfound friends. We see Celebi as delicate and friendly, then we witness it descend to cruel brutality as it destroyed its home under Vicious’ command. 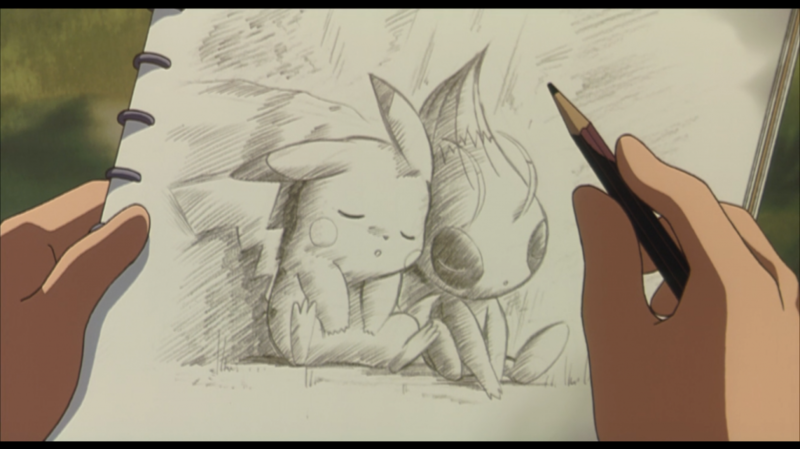 At this point, Celebi had developed enough as a character to inspire grief and emotion as it is subjected to suffering. I’ll be honest — I even cried when Celebi died. Beyond the believable and engaging characters, Celebi’s mortality brings a sense of realism to the film that was lost in Entei. Despite its concept, the Pokemon series uses the threat of Pokemon death surprisingly rarely. In previous films, we see Pokemon beat on each other without mercy and survive to fight another day, more tireless machines than living organisms. That gives Celebi’s death much more gravity. It’s an important moment in the Pokemon series, serving as a scary wake-up call to fans. We celebrate their brutality, yet often forget that the series is built around the notion idea Pokemon are intelligent, vulnerable creatures just like you and me. Celebi’s death hits like a wave, an instant reminder that Pokemon are subject to life and death despite the tremendous power they contain in their bodies. And that’s the key, the element that makes Celebi such a success. After two underwhelming films, the film creators finally managed to find the lost ingredient which made Mewtwo such an endearing film: Make the Pokemon compelling, vulnerable characters. Celebi, the central Pokemon, is a multi-dimensional character rather than a plot device, like Lugia or Entei in their films. This contributes to this movie’s unique identity and is the primary reason why I so highly value it. Thanks to a coherent self-contained plot, an endearing Pokemon character, and its realistic portrayal of Pokemon mortality, Celebi remains my favorite Pokemon film of the entire series.